In a large saucepan, heat the orange juice, lime juice, and sugar until the sugar is dissolved. Remove from heat. Stir in the wine, brandy, and fruit. I add the fruit in as I slice it to prevent it from browning or drying out. Serve over ice. Add sparking water or club soda right before serving if desired. I would do it per glass, filling it with 2/3 sangria, 1/3 fizzy water. You could also do half-half. Replace the wine with a 2-quart (1.86-liter) jug of grape juice and skip the brandy. You might also want to skip the added sugar, depending on how much sugar is in the grape juice already. 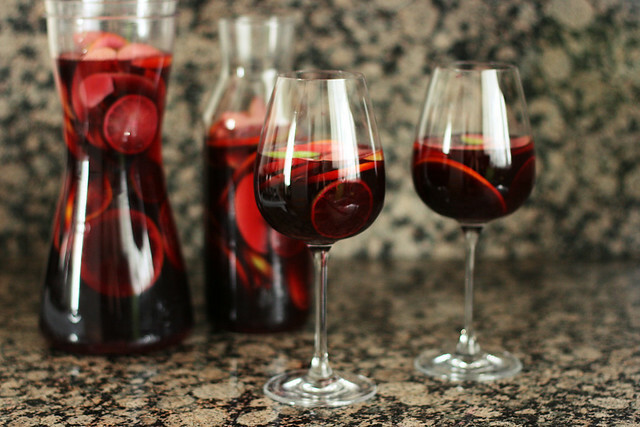 Chill the sangria in the fridge for at least 5 hours, preferably at least 8 hours, to give the flavors a chance to combine. If you’re planning on drinking it straight, without any added fizzy water, start out with 1/4 cup (59 ml) of brandy and add in more to taste. If, on the other hand, you’d like to add in lots of fizzy water or prefer stiffer drinks, you might want to increase the brandy to 1 cup (236 ml). Berries look nice but will disintegrate quickly and won’t do much for the taste if they steep. You can add 1/2 cup (118 ml) of berries to the sangria just before serving, or in small quantities individually per glass. I would add raspberries, blueberries and/or strawberries (hulled and quartered).